An excavator removes a piece of the Junior Fair Building on Saturday morning. 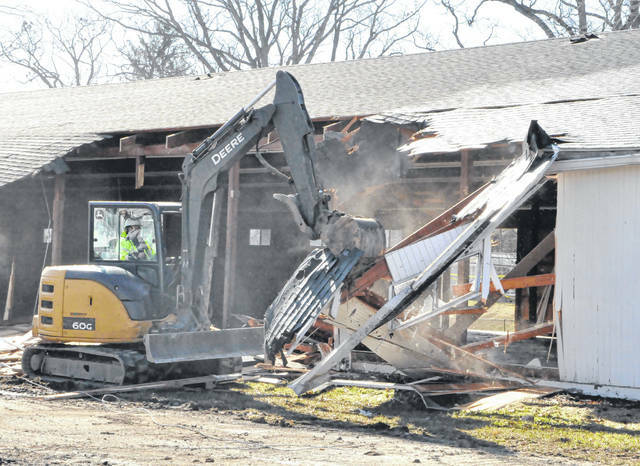 The structure, which was built in the 1960s at the Delaware County Fairgrounds, is being razed to make way for the new Agricultural Center. 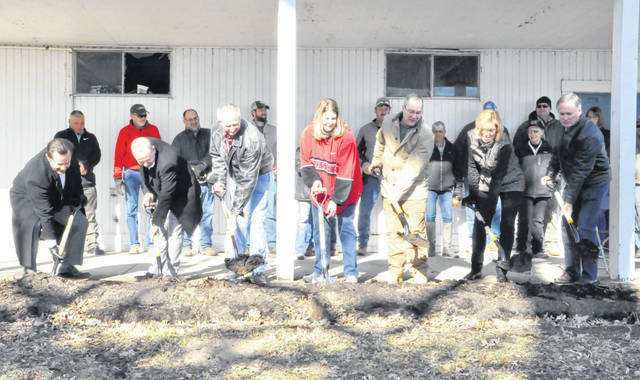 The Delaware County Agricultural Society held a groundbreaking ceremony at the fairgrounds on Saturday for the new Agricultural Center. The facility is set to open in 2020. Pictured, left to right, are state Rep. Rick Carfagna, state Sen. Andrew Brenner, County Commissioner Gary Merrell, Delaware County Fair General Manager Sandy Kuhn, DCAS board member Chip Thomson, Delaware Mayor Carolyn Kay Riggle and County Commissioner Jeff Benton. To say Delaware County has changed a bit since the 1960s would be an understatement. However, for a county that has become a yearly staple at or near the top of the list of fastest-growing counties in the state, one of its focal points — the fairgrounds — hasn’t quite undergone the same transformation. On Saturday morning, that all changed as state and local officials gathered at 236 Pennsylvania Ave. in Delaware for a rebirth of sorts for the Delaware County Fairgrounds as a demolition crew began the process of tearing down the 9,600-square-foot Junior Fair Building (built in 1964) to make way for what will become the fairgrounds’ crown jewel — the $3 million Agricultural Center. While the moment was bittersweet for some of the local leaders who gathered to watch the demolition and to take part in the groundbreaking ceremony for the new facility, it was also viewed as welcome sight. “I’ve been coming to these fairgrounds since I was a little kid, which has been more than a decade or two ago,” Delaware County Commissioner Jeff Benton said. “Quite honestly, we have not invested in our fairgrounds since I was a kid. This is a huge investment, and what is neat about it is this is just the dawn of a new era. “This is just the beginning. We’ve got a bunch of more projects planned that will truly transform this fairgrounds into the really ultimate showcase that we know that we should have here in Delaware County,” he added. Delaware County Commissioner Gary Merrell called the occasion an “incredible and great day” for the county, the city, and the taxpayers who will be able to utilize the new facility. As for the new Agricultural Center, DCAS Board of Trustees President Don Howard said the the expectation is the building — which will house the fair office, Delaware County Agricultural Society Hall of Fame, and the junior fair — will be completed no later than spring 2020. Howard added the facility will be “heated and cooled,” and portions will be open and available for use year-round. According to a press release issued by the county, the Agricultural Center will also house Junior Fair exhibits during the county fair, and additional features include restrooms and a warming kitchen. As for the cost of the facility, the press release states the price tag is estimated to be around $3 million, with funding coming from the five-year, 3 percent bed tax approved by county voters in March 2016. “We are going to see a lot of changes (at the fairgrounds) in the next few years because of the bed tax that was passed,” Merrell said. Delaware Mayor Carolyn Kay Riggle added a project of this magnitude just didn’t happen overnight. Joshua Keeran is the editor of The Delaware Gazette. He can be reached at 740-413-0900.